This mindset was put to the intense test lately, as I am in the process of relocating to a new home. It is in a neighboring town, but nearness does not guarantee easiness! It took well over two years to find and obtain a suitable ranch style house that has a spacious area for my Reiki and meditation business and practice — a long journey of looking at properties both online and in person and making many bids that never went anywhere. And now, finally, my husband and I are excited and looking forward to living in our new house. However, there is much remodeling and renovation to do and this process has been incredibly SLOW. And although our first contractor was highly recommended, he attempted to take as much of our money as he could con us out of, since we trusted and believed in his plans and promises. He did little work. We were actually relieved to “fire” him and remove his negative vibrations from the new abode. Unfortunately, we hear this contractor story is sadly all too common. So now we have a new contractor who is actually doing the work and making progress, though he has a very small team (and other commitments with other homeowners as well) so everything is still in progress. But he and his men show up and actually ACCOMPLISH much! This has been a test of my own patience and I am grateful to have my Reiki practice and mindset to help see me through. However, it has been an stressful time in my life. I DO continue to hold the vision of what my new place (and Reiki space) will look and feel like when it is remodeled and clean and all the dust/spackle/smell of paint has dissipated. But that vision is currently just in my mind and heart. One of my own particular lessons is to be conscious of that line between what is within my control and what is not. I am a planner and I like things to happen in a very balanced and harmonious way. However, some things are just beyond our control and we must cope with that and trust that all will happen in a way that is right for us. Always hold on to your own personal vision — keep it strong and clear in your mind and in your heart. Stay the course and persevere as you move along your path toward goals and plans. Trust that you WILL enjoy the fruits of your labor and your dreams! I create clear, joyful visions of what I wish to achieve in my life. I know that contrast and challenge ultimately infuse me with greater emotional strength. I stay calm and focused in the NOW moment to accomplish the tasks at hand. Ours is an ever-changing, shifting world of impermanence. Our circumstances and surrounding energy flows and changes. WE change, evolve and transform over time. Nothing lasts forever here in our corporeal, physical world. Our joy is a blend of who we are at our core essence, plus how we react to those people and circumstances around us. To be immersed in the optimistic mindset and align with the great, potent, enlightening stream of the Universe, we need to embrace adaptability and flexibility. 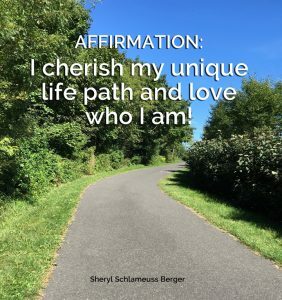 Yes, we can set goals, make plans and integrate the Law of Attraction into our lives — intuition assists us in navigating on the right track for our unique life journey. It helps us manifest and CREATE. However, some aspects are simply beyond our physical and mortal control. That is the grand adventure of our lives. Do the personal work that you can — be of the consciousness of adapting and “going with the flow.” Yet be open to the way your individual path unfolds. Sometimes that means to absolutely surrender to a Higher Consciousness — to let go of the struggle of overwhelm and human worry. For excessive worry only results in excessive stress which then can result in unhappiness, depression, negativity and the like. When you trust in the outcome, that all will be well in your journey, that you are precisely where you belong on your particular path — you will be in that spectacular, wise flow, and so much more joyful and peaceful. Do the inner work. Trust. Believe. Listen to your powerful Inner Guidance. Know that a supportive Universe in its amazing Divinity will guide and support you and is working on behalf of your Highest Good. In that place of harmony between intention and surrender will be your happiness moments, your most serene space of existence… Relax and simply enjoy the journey! I relax into the knowing that my personal path is unfolding in exactly the way that is right and joyful for me. I find inner peace in trusting that “all is truly well” in my world, as the Universe supports my journey. I embrace the skills of adaptability and flexibility as they serve me well in living my most optimistic and serene life. Do you take time to envision what you wish to create, what you wish to bring forth into your own personal reality? 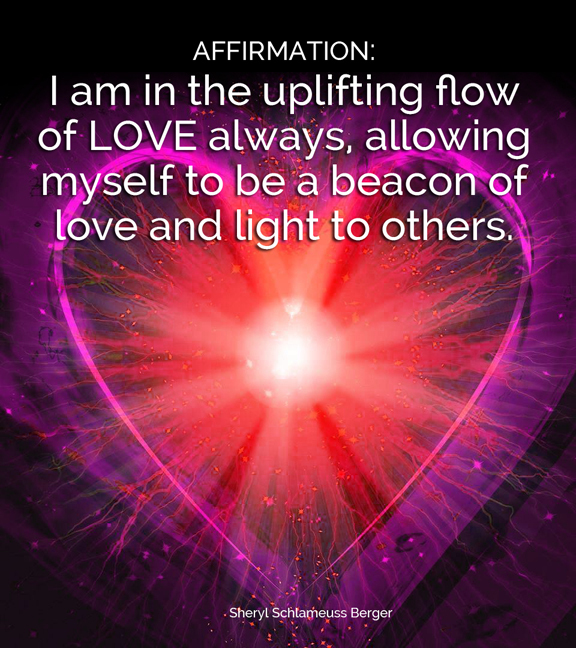 Do you move into the powerful energy of setting intentions and goals, of being in alignment with the high vibrations of what you desire to manifest? Experiencing your most creative, inspired incarnation of your soul self can be exquisitely fulfilling! You must focus on being “on purpose” – really tuning in to just what you want, having true clarity about which life path you wish to walk. Sometimes that seems like it can feel beyond ones reach. However, be open to your inner guidance, that profound knowing about the best way for you to personally navigate forward. Create crystal clear visions of your life dreams. See yourself achieving them! Bask in the beautiful, sublime energy of feeling good about YOU, of feeling at peace with each sweet moment of being in alignment with your soul’s mission. On a more earthy level, allow and encourage yourself to feel HAPPY with small achievements, with feel-good, slice-of-life moments that just touch your heart. Yes, we all have those. Even in the midst of turbulent times, we can find these, though it takes more looking. So make sure to notice these, to be present and joyful, to simply savor the luscious-ness of these. It is these kind of moments that do move you powerfully along on a good-feeling journey. These are the times when you feel so delightfully ALIVE. These are the moments when you are “in the flow” and all is incredibly right with the world. I take specific steps to create my most magnificent and inspired reality. I focus on clearly envisioning my goals and desires. I celebrate my successes — and feel delighted by each accomplishment, no matter how small or simple. Are you in the flow and process of designing a joyful, fulfilling life story? Are you totally aware that you are the architect of your present and your future? I hope you do live in awareness of this, or maybe this will serve as a clear reminder. And if you are truly unfamiliar with this concept, then maybe this will be a bit of an awakening for you. As a Reiki Teacher and Practitioner, I do meet many who come for healing and relaxation sessions. One of the biggest complaints/ailments of these times is stress. I’m sure that is no surprise to most. Stress can be a killer. It can cause tension, anxiety, imbalance, discord and if left to fester in a prolonged way, it can manifest into serious symptoms and dis-ease. Most people would love a magical, anti-stress pill! So in place of that, many turn to antidepressants, mood elevators and the like — and today, doctors hand them out like candy. To be in the flow of inner peace and well being, it takes inner WORK. There is no magic wand to wave. It may take a combination of regular exercise, a truly healthy, nutritional way of eating, an excellent therapist, along with holistic/meditation/stillness practices. It takes thinking in a brand new way. So many people feel “stuck” in old, negative thought patterns. It is essential to awake to the knowing that you — and only YOU — can make the shift to more joyful ways of thinking. Don’t expect your parent, your child, your partner/spouse, your friend to provide for your happiness. When you begin to take responsibility for your life and your state of mind, that is when your real power emerges. And this doesn’t mean you have the ability to change all that is happening in your life. Your job, your family, the challenges in your immediate environment — some of that you may have to learn to cope with. What you CAN do is choose the way you react to all that is happening in your surrounding reality. Your reaction is totally within your own control. It is not always easy to tune in to that place of calm and harmony and flexibility — but it IS doable. So by accepting responsibility for your own mindset and choices, you become that “conscious creator”. And if you can be in that place emotionally, then you will see how GOOD it feels. And how productive and optimistic you can be. Are there times you will slip into old patterns, go down the rabbit hole of despair — sure, it happens. But know that you are strong and can bring yourself back to the light. Be kind and nurturing to yourself, especially at these times. So begin to truly take charge of writing your life story – what is your delightful vision for yourself for the future? Make it happen, one step at a time — and remember to enjoy each moment of the journey! I create my life story to be fulfilling and uplifting for me. I cherish my unique path and love who I am! I always take time to be kind and gentle with myself. Are you given to an ultra fragmented mind with thoughts in all directions? Do you ever have that sensation of a dizzying swirl of memories, regrets, thoughts, wishes, plans, worries all vying for space in your head at once? It is it healthy? Is it productive, really? When ones attention is spread all over the place, it can feel like a loss of control and it is certainly the antithesis of inner peace. So what many people seem to be seeking is peacefulness, stress-management, and/or a more meaningful life experience. By being focused and able to give ones real attention to the immediate moment, or task of the moment, brings more harmony and serenity into your reality. It appears to be a natural human tendency to be mired in the past, with vast accumulations of worries and regrets — or overwhelmed with concern and worry about the future — “What will happen… etc. etc?” Where do you fall on this spectrum? Bringing ones mind into living more presently has lovely benefits, and will allow you to feel a greater flow of ease with life. 1. Become aware of your state of mind. Are you uncomfortably unfocused more of the time than not? Check in with your thoughts. If it is easy enough to pull your concentration to the present and hold it there, then you are on the right track. However, if doing so is a momentous challenge, then begin to pay attention to beginning to achieve a sense of mindfulness. 2. When you feel stress, disconnect and tension begin to arise, just stop, sit and breathe. Focus on your breath and take five slow, deep cleansing breaths. This is not a magic solution, but it will help bring you into the present and head off anxiety before it becomes too overwhelming. 3. Strive to speak more slowly. I know many people who seem to speak at the speed of light — I think of them as “fast talkers”. It is sometimes stressful just listening to them. Check in with yourself – do you feel you have to speak ultra fast to get your thoughts expressed? Record yourself speaking and then listen. If you find yourself to be a fast talker, allow your speech to slow down in general. Work on making statements in a more thoughtful, calm way. This can make an amazingly positive difference in your life! 4. When you are frenzied, feeling particularly hectic, you can do what I have termed talking to yourself in your Higher Self reminder voice. Let your inner guidance lead. And allow your soul-self to remind you to “slow down and pay attention” or imagine you are hearing the phrase “be right here, right now.” If you have privacy, you can speak softly out loud, “Pay attention to this moment.” or “Just be in the moment” and it is amazing how you can shift your energy and concentration with a little boost from that inner voice. 5. When you are performing a simple or mundane task such as brushing your teeth or combing your hair, avoid letting your mind wander onto tomorrow’s “To Do” list. Instead, simply BE in the moment. For instance, pay attention to brushing each tooth carefully and diligently. Or whatever task you are doing, just DO that particular task without a runaway mind. 6. Carve some time out of your busy life to schedule a “nature break.” Spend time and connect with the natural world around you. Walk barefoot in the soft grass or in the sand. It is always rejuvenating to go to a beach or a lake or body of water and just allow yourself to connect with that peaceful element of water. Take a walk in the fresh air — even a short one is revitalizing and good for you both mentally and physically. And it does help you be present. I take time each day to connect with my breath, and this causes a peaceful, mindful shift within me. I do the inner work to focus on the present moment and I am empowered! I find beauty and solace in simple aspects of my immediate environment. My hands grew old. I don’t know exactly when it happened, but now I look at my hands and they are lined and veined. They are the hands of a “mature” woman. I began to navigate the dating world in my mid thirties, mingling in a single parents scene of those my own age, plus many older. I remember what a close male friend always said about having a good indication of a woman’s age by the appearance of her hands. “A woman in her thirties still has that nice smooth skin on the back of her hands…but most that are in the next decade, not so much.” And he gestured at my hands, “See how smooth yours still are!” I was pleased that my hands were still something to admire. As we would mingle and peruse different single venues, my friend discretely pointed out examples of women acquaintances whose hands had shown signs of age and maturity. He would selectively approach only those who had that “smooth skin” with the hopes of connecting and perhaps going out for a date. Sadly, our modern society places so much emphasis on youth and looking young. Everyone does their best not to “look old” and it takes grace to be open to permit oneself to age in a relatively natural, upbeat, joyful way. In general, we have such resistance to the concept, taught to us by the world in which we live — all the focus on the glory of youth. And in these last 12 years, as a Reiki Practitioner and Teacher, Reiki energy has flowed through my hands — energy that has given benefits of peace and healing to many others. Compassion toward others has manifested through my hands, as I gently place my them on recipients of Reiki in comfort and connection. I greet each life stage with acceptance and grace. My thoughts and attitude determine my outlook — I choose positive thoughts along each step of my life journey. I cherish the life wisdom I accumulate along my unique personal path. Are you sometimes too quick to criticize others? Do you tend to be judgmental in your attitude? Or are you even aware of this aspect of yourself? In general, as those drama-seeking, emotion-filled human beings that we are, we tend to view others and their beliefs and actions with caution, skepticism and often great criticism. And I am not talking about that large political arena. I am referring to your own personal life and those relationships that surround you — even your immediate family members. Sometimes it is that close personal and social circle in which people seem to know how to press our buttons and we are quick to respond in a reactive, not-so-understanding way. Within families there often tends to be bickering and ego-driven conclusions, arguments and gossip. We strike out and we JUDGE, sometimes in a very loud way. It is so essential to begin to recognize this sense of judgment within ourselves, acknowledge that conflict-creating aspect of ourselves in order to begin to do some inner work to make a shift. The wisdom of living a compassionate, loving, balanced life is embodied in the Reiki Precepts, which overall asks for us to strive for more humility and compassion, being as non-judgemental as possible. They encourage us to tone down or even silence the inner critic… letting the ego gently step aside. You don’t have to be Reiki-trained to follow this sage advice for living a kind, serene life. Let us simply place our focus on experiencing our best and most compassionate journey. For letting go of judgment frees us from great resistance within, taking us a step closer to being that highest and best version of ourselves. For ultimately, who are we to judge others? Are we so perfect and beyond reproach that we know everything — absolutely not! And certainly being judgemental impacts our worldview and is part of the reason why our larger reality is in this challenging, disconnected place of sadness and separation. I move into the flow of peacefulness, and see others with more compassionate eyes. I release my sense of judging others and strive to be more tolerant and understanding. I relax my standards by which I view others, and I acknowledge and respect that everyone has their unique life path. We are living in a time of cosmic turbulence — of dramatic shift. Do feel it? Do you feel tuned in to periods of extreme unrest, uncertainty, personal turmoil? 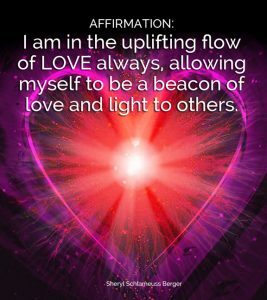 I have felt this deep sense of upheaval, of things stirring and changing, and I believe it is part of the process of transformation, and ultimately of greater alignment with my soul purpose and mission. Sometimes I feel my life is spinning almost out of control. But wait, you say, aren’t you Reiki trained? Doesn’t that keep you peaceful inside despite all the challenges swirling around you? It certainly helps, yet for during some time periods, it is “buckle your seatbelt — you are in for a wild ride!” And then I call tap into my Reiki training, striving to maintain some semblance of balance through this cosmic roller coaster experience. And that strong head talk helps propel me in a more focused direction. However, I observe that in some moments my life feels like an unbridled, spirited and testy equine with an active mind of its own. And I learn over and over again that not everything IS in my control as much as I strive to take responsibility of the human voyage I am on. Sometimes I need to remind myself to acknowledge a Higher Power. To let go of my white knuckled grasp on those reigns and let the peacefulness of my soul and the Divine just flow within me. I consciously allow myself to release resistance… to surrender to the powers that be! To assist my understanding and compliance with this cosmic state of change, it has become very clear to me about the necessity of remaining present. This is an important survival tool that can serve all of us well on many levels. To navigate choppy waters, focus on the next little piece of the voyage. Place attention on the NOW moment. When I consistently remind myself of this, it helps bring an immediate sense of relief and serenity into my heart and mind. Do that inner work to live powerfully in the PRESENT. Know that not everything is in your own control. Yet, DO take responsibility for those things that you can affect and influence. And always be of authentic heart and come from a place of COMPASSION. I know that at times I need to surrender to the flow of Divine timing — and trust that everything will work out for my Highest Good. I embrace the concept of mindfulness — being present — to help me remain in the space of inner peace. I take responsibility for my actions, and I strive to be in compassionate interconnectedness with others. I am sitting out on my patio at dusk. It is the last unseasonably hot day in October. The forecast spans out with rain and cooler temperatures starting tomorrow, so I am sure this truly is the last HOT day to enjoy. Have I grasped and seized the beauty of this day — certainly not enough! Of course, there was some work to do, some chores, some errands. And late in the afternoon it finally dawned on me: why was I not just EXPERIENCING this gorgeous autumn day, a day so reminiscent of summer that it makes one lose all real track of time and seasons. I am grateful for this day — this glorious day that I get to SEE and FEEL… and be part of! Sometimes we take all that for granted — the very essence of life. Just focusing on our breath can remind us — how natural and peaceful we can be even for but one moment in time. I encourage you to partake of your life in a BIG way — do not sit on the sidelines and mope. Strive to EXPERIENCE the adventure of it all. Yes, we all know that some facets of our lives are not always perfect. We are often faced with challenges and drama as that is part of our existence here in the physical plane. However, let us be in the supreme space of appreciation for BEING here, having a physical life, having interaction with others, having beautiful and loving relationships with others. Having free will to make CHOICES and to set goals that resonate with our heartfelt dreams and desires. We need to remember how powerful and creative we can be, for sometimes we forget. And let us be in the feeling of gratitude for having this ability and this knowing. Your life will be enriched and uplifted as the vibration of gratitude flows powerfully in your heart and mind! I am thankful for my own abundantly fascinating and rewarding life path. Connecting with others who are supportive and loving brings the flow of gratitude into my entire being! I appreciate all the blessings in my life, both large and small!